Stop by and see what we do in the publishing world. Yes, we still make stuff out of paper. It's so retro, and you're going to LOVE it. If you're in the neighborhood, check out the reception too. Thursday, Feb. 24 from 6-8 PM. Will there be drinks? Um, is this publishing? 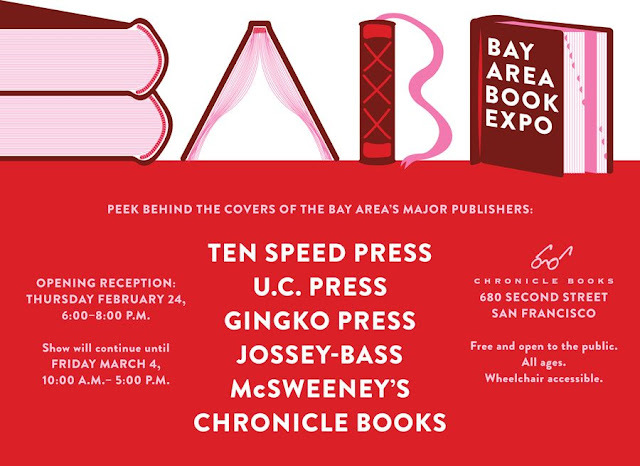 What: Bay Area Book Expo (BABE) - The purpose of this exhibition is to celebrate the work of the major Bay Area publishers, featuring 10 examples of their work from the last ten years-–the first decade of the 21st century. Why: Since the demise of the San Francisco Bay Area Book Council festival of the 1990s, there hasn’t been an opportunity for publishers to show-–and for interested public to see-–their work. This is an opportunity to do so and celebrate the art and design of the book. This is of particular relevance as the book has begun to take on a new identity as content for e-readers, tablets and the like.